Analysis: Quinn agreed to a one-year, $8 million contract with the Cowboys to make it work and Miami won't have to pay any of it. Combined with the departure of Cameron Wake, the Dolphins now have a huge need on the edge going into this year's draft. Quinn, meanwhile, will team up with Demarcus Lawrence in Dallas to form one of the better pass-rush tandems leaguewide. Analysis: There are reportedly still minor issues to be worked out with the deal, but it nonetheless seems as if the Cowboys are gaining a valuable edge defender to bolster last year's sixth-ranked scoring defense. 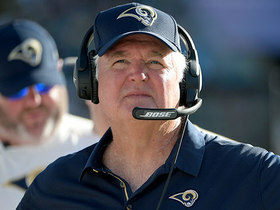 Tom Pelissero of the NFL Network reports Quinn has agreed to a new, one-year deal to make the trade work. 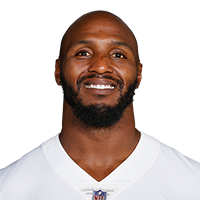 Analysis: The Dolphins would still save around $12 million in cap space if they were to trade or cut Quinn, so it remains likely that the team will move on from the 29-year-old defensive end. Quinn has notched 15 sacks across 31 regular-season games the last two seasons, and could garner interest on the trade market from teams in need of a pass rusher. Analysis: Quinn wraps up a disappointing season 2018 in appropriately quiet fashion, ending the year with 38 tackles, 6.5 sacks and two forced fumbles. With the Dolphins likely headed for an offseason of changes to the coaching staff and player personnel, Quinn's lackluster production could put his future with the team in legitimate question. Miami would save $12.9 million on 2019's cap if they were to cut Quinn. Analysis: Quinn has now posted a sack in four straight games, bringing his season total to 6.5. 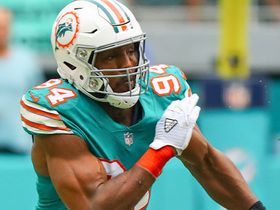 Despite coming on down the stretch, the veteran linebacker is on track to conclude a fairly unremarkable first season with the Dolphins. Quinn has yet to miss a game in 2018 and will look to close out the year strong against the Bills in Week 17. Quinn posted two tackles (both solo) and one sack during Sunday's 41-17 loss to the Vikings. Analysis: Quinn has now managed to sack the opposing quarterback in three consecutive games, bringing his season total to 5.5. He'll look to keep that streak alive against the Jaguars on Sunday. Quinn recorded three tackles (one solo) and a sack across 46 defensive snaps in Sunday's win over the Patriots. 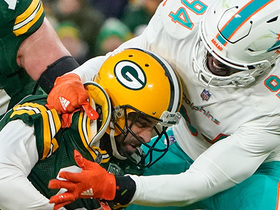 Analysis: The veteran is seeing about 60 percent of the defensive snaps this season in Miami but has managed to record 33 tackles and four sacks to go along with two forced fumbles. Sunday marked his second sack in just as many games, and he'll look to continue that streak in Minnesota against the Vikings. 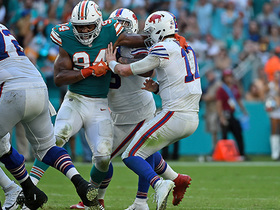 Quinn recorded two tackles (both solo), one sack and one forced fumble during Sunday's 21-17 win over the Bills. Analysis: Quinn posted his first forced fumble of the season during the Week 13 win and now has 3.5 sacks on the season. The veteran linebacker will look to log another strong performance against the Patriots on Sunday. Quinn recorded three tackles (two solo) and 1.5 sacks during Sunday's 31-12 loss to the Packers. 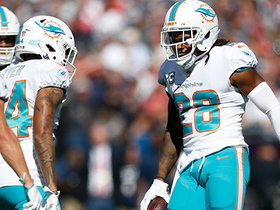 Analysis: Quinn was a lone bright spot for Miami's defense, which allowed 145 rushing yards and two touchdowns to running back Aaron Jones during Sunday's loss. The 2011 first-round pick consistently pressured quarterback Aaron Rodgers throughout the Week 10 matchup and posted his highest single-game sack total of the season. 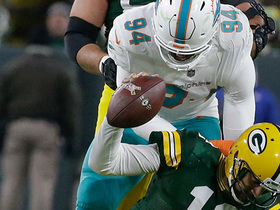 Miami Dolphins defensive end Robert Quinn sacks Green Bay Packers quarterback Aaron Rodgers for a loss of 11 yards. 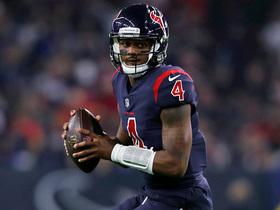 Houston Texans quarterback Deshaun Watson scrambles through the line for a 14-yard gain against the Miami Dolphins on Thursday Night Football of Week 8 of the 2018 season. 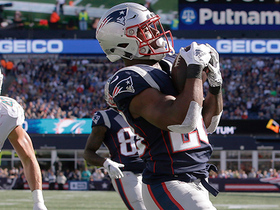 New England Patriots quarterback Tom Brady drops dime under pressure to running back James White for 14-yard touchdown. The "NFL Total Access" crew discusses the Los Angeles Rams trading linebacker Alec Ogletree to the New York Giants and if the Rams can absorb that loss. 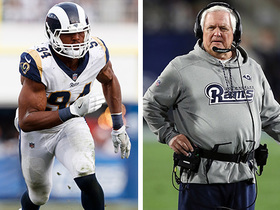 NFL Network Insider Ian Rapoport explains why the Los Angeles Rams agreed to trade defensive end Robert Quinn to the Miami Dolphins. 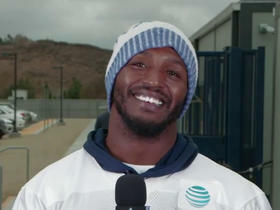 Los Angeles Rams linebacker Robert Quinn joins "NFL Total Access" and discusses his team and activities off the field.